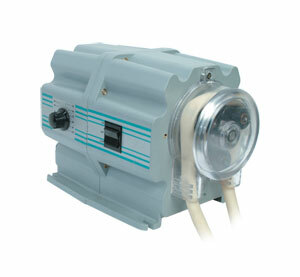 The FPU420 Series OMEGAFLEX peristaltic pumps offer a variable speed drive system. Three models are available from 0.36 to 800 mL/min. Dual pumpheads can provide flows of up to 1600 mL/min. All models have the benefits of the OMEGAFLEX pump line, including non-siphoning, self-priming, contamination-free pumping. Each unit is supplied with a 1.8 m (6') long, 115 Vac power cord and is enclosed in a rugged polyurethane-painted steel benchtop case. Silicone or Norprene® precision-bore tubing [230 mm (9") length] with polyethylene tubing unions are included with each pump. Dual head models, with two separate outputs also available. 참고: FPU420 Series comes complete with 4 lengths of .22 m (9") (1/16", 1/8", 3/16", and 1/4") Norprene tubing, tubing unions, 2 rollers, mounting plate, 1.8 m (6') 115 Vac power cord, painted steel benchtop case, and operator's manual. FPUVS4000 comes complete with norprene tubing, tubing unions, 1.8 m (6') 115 Vac power cord, and operator's manual.